The Federal Trade Commission, or FTC, is the United States enforcement agency for laws against deceptive advertising. The FTC Act creating the Commission was signed into law by Woodrow Wilson on September 26, 1914. 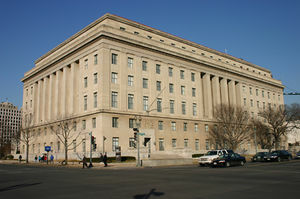 U.S. Federal Trade Commission building in Washington, D.C. The FTC is charged with enforcing laws against false and deceptive advertising, including ads for tobacco products. It ensures proper display of health warnings in ads and on tobacco products; collects and reports to Congress information concerning cigarette and smokeless tobacco advertising, sales expenditures, and the tar, nicotine, and carbon monoxide content of cigarettes. The Federal Cigarette Labeling and Advertising Act (FCLAA) was designed to make Americans more aware of the adverse health effects of smoking. As enacted in 1965, the law required health warnings only on cigarette packages. In 1984, the law was amended to require that one of the four warning labels listed below appears in a specific format on cigarette packages and in most related advertising. Cigarette Smoke Contains Carbon Monoxide. Health warning labels on outdoor-billboard advertisements are allowed to be somewhat abbreviated from those appearing in newspaper, magazine, and product packaging. Warning labels are not required on specialty advertising items (such as pens, pencils, clothing, and sporting goods) that carry cigarette company logos, brand names, or other promotional messages. These items must bear warning labels, however, if they promote smokeless tobacco products. Warning labels are not required for cigars, pipe tobacco, and roll-your-own cigarette tobacco. The FTC also enforces regulations that require health warnings to appear on all packaging and in advertising for smokeless tobacco products. These requirements are authorized under the Comprehensive Smokeless Tobacco Health Education Act of 1986, enforced jointly by the FTC and the Department of Justice. Smokeless tobacco products such as chewing tobacco, moist snuff, and plug tobacco are used orally. The Act requires manufacturers, packagers, and importers to place one of the following warning labels on smokeless tobacco packages. The Act requires that the respective warnings be placed in a circle and arrow format on all forms of advertisements except billboards. The FTC has issued regulations to determine the size and format of the health warning in relation to the size of the package. The Cigarette Act and the Smokeless Tobacco Act require manufacturers and importers to submit a packaging and advertising plan for FTC approval. The plan must provide for appropriate label rotation on packages and in advertising for each brand of cigarette or smokeless product, whether manufactured in the United States or imported here. The law requires that a health warning appear in a conspicuous location on advertisements and packaging, and the manufacturer's plan must assure an even distribution of the warning statements in all parts of the U.S. where the product is sold. Both of these laws require the FTC to report to Congress. Under the Federal Cigarette Labeling and Advertising Act, the FTC reports annually the current practices and methods of cigarette advertising and promotion. The Comprehensive Smokeless Tobacco Health Education Act of 1986 contains the same reporting requirements -- but on a two-year basis. This Act also requires the FTC to compile for Congress current sales figures for smokeless tobacco products. Amendments to the Federal Cigarette Labeling and Advertising Act in 1971 and 1973 banned advertisements for cigarette and little cigar products from radio and television. The Comprehensive Smokeless Tobacco Health Education Act of 1986 extended the broadcast advertising ban to smokeless tobacco products. For many years, the FTC has obtained and publicized information about the constituents of tobacco smoke, such as tar, nicotine, and carbon monoxide. Through these disclosures, consumers who smoke have been able to choose brands with tested lower concentrations of such substances. In addition, since 1971, all manufacturers have been voluntarily disclosing the tar and nicotine content of cigarette brands in their advertisements. In 1938, the FTC was given the authority to regulate false and misleading advertising.(L. White, Merchants of Death, 1988). In September 1955, the FTC finally laid down rules for cigarette advertising and enacted the following bans: a ban on assertions that smoking had favorable effects on the respiratory, digestive, or nervous system; a ban on claims of medical approval of smoking a particular brand; and a ban on any unproven claim of nicotine content. In 1958, the FTC asked the cigarette industry to develop uniform specifications for testing tar and nicotine levels. In 1959, the FTC filed suit against Brown & Williamson for its Life cigarette advertising campaign. The low-tar claims were not substantiated and the advertising was misleading. In 1960, the FTC made a deal with the tobacco Executives -- the FTC would ban the following advertising claims: statements of tar and nicotine content, even if there was scientific proof they were accurate; claims that a filter was efficient; all other health claims, even implied ones; and the industry voluntarily agreed to obey the new rules. In 1966 the rules were quietly shelved and the public was once again allowed to consider tar and nicotine levels in cigarettes.(L. White, Merchants 1988). The FTC stopped misleading cigarette 25 times between 1938 and 1968.(L. White, Merchants 1988). On May 31, 1994, the FTC voted (3-2) to close an investigation of whether R.J. Reynolds Tobacco Company used the Joe Camel cartoon character to encourage children to smoke. The FTC decided against taking any action against R.J. Reynolds. Commissioners Mary L. Azcuenaga, Deborah Owen and Roscoe Starek III voted to drop the investigation. Commissioner Dennis Yao and Chairwoman Janet Steiger voted to continue the investigation. (Associate Press 6/7/94). The FTC smoking test is not an accurate measure of tar and nicotine levels that reach the smoker because people inhale deeper and longer than the FTC tests, per Dr. John Slade, people get two times more nicotine than FTC test results reveal. Scientific studies over recent years have shown that smokers get the same amount of tar and nicotine no matter what cigarette they smoke, per the NY Times. "A smoker can draw 3 milligrams of nicotine out of a cigarette that is rated as a 1 milligram yield by the FTC test," per Dr. Jack Henningfield. (AP 5/2/94). The level of nicotine in the blood is determined by: (1) the number of cigarettes smoked per day, (2) filter vent blockade, (3) number of puffs per cigarette, (4) interpuff interval, (5) puff volume, (6) puff duration, (7) puff velocity, (8) percent puff inhaled, (9) inhalation volume, and (10) inhalation duration. Using any of these compensation methods, a smoker can extract and self-regulate the amount of nicotine he or she receives, irrespective of the FTC test numbers for nicotine. (D. 8/3/94). The testing measures relative, not absolute, levels of tar, nicotine and carbon monoxide. Thus, depending on what level of nicotine is addictive, all cigarettes could be addictive as measured via this measure. Therefore, the testing could be viewed as irrelevant and of no value, if not misleading by omission. (C. Zimmerman memo 6/3/94). In a July 1994 letter to the National Cancer Institute, FTC Chairwoman Janet Steiger asked the NCI to review the FTC's method for rating tar and nicotine levels of cigarettes. Steiger said there was a concern that FTC's tests failed to take into account the possibility that people change their smoking habits to compensate for lower nicotine and tar. (NYT 7/21/94). In July 2008, the FTC released a report detailing how 44 major food and beverage companies spend $1.6 billion annually targeting kids under 12 and those 12 to 17 with junk food marketing. The Campaign for a Commercial-Free Childhood, by the FTC's own admission, noted some significant gaps in the funding calculation, however: advertising and product placement on general audience programming watched by children, such as American Idol and The Simpsons, were not included; internet advertising, particularly company sponsored websites, is relatively inexpensive and expenditure data does not capture its impact; in-school advertising does not include regional and local or franchise spending for fast food companies; and cross-promotional arrangements which do not usually require a fee yet turn entire programs and movies into advertisements for the foods they promote. Michele Simon notes on Daily Kos that the report also failed to include the value of the 1.2 billion toys that come with kids' fast food meals every year. Despite these monetary discrepancies, the report revealed the many ways that kids are bombarded daily with messages to eat the wrong foods and the myriad techniques used to reach them. As they note, "product marketing campaigns directed to youth typically are fully integrated:" "a child might first see an ad on television for a food product; the child would then encounter related promotional displays or product packaging in a retail setting or restaurant; the child might receive a related toy or other premium immediately upon purchase of the product or might be directed to the product website to enter a package UPC or other code to participate in sweepstakes or to receive "points" redeemable for prizes or digital content, such as ringtones; once on the website, the child might interact with the brand through online games or by sending "e-cards" (electronic greeting cards) or "send-to-a-friend" viral marketing messages to others." The report explains how toys are used by fast food outlets in the cross-promotion of films or other entertainment media, and how the marketing of junk food has gone beyond television to the internet. Advergames are frequently featured on kid-friendly corporate websites. Games are often designed so the consumption of a food product is the objective. The latter part of the report focused on the food industry's "progress" in improving their marketing practices. Major corporations have made many promises to do better, many now making what they call "pledges," voluntary, self-regulatory guidelines for marketing to children. The FTC recommends that all companies that market food or beverage products to children under 12 adopt meaningful, nutrition-based standards for marketing their products that would extend to all advertising and promotional techniques. They also called for companies to improve the nutritional profiles of products marketed to children and adolescents, whether in or outside of schools; cease the in-school promotion of products that do not meet nutritional standards; and improve the quality and consistency of the nutritional criteria adopted for “better for you” products. The FTC's reliance on voluntary, self-regulation is contrary to actions recommended on the global level. The International Obesity Taskforce, for example, released in August 2008 the "Sydney Principles" (named for a 2006 conference in Australia),  which call for "legally-enforceable regulations" with "sufficient authority to ensure a high level of protection for children from targeted marketing and the negative impact that this has on their diets. Industry self-regulation is not designed to achieve this goal." The principles also broaden the definition of "child" to match those of the UN Convention on the Rights of the Child that define a child as under the age of eighteen. The FTC works for the consumer to prevent fraudulent, deceptive and unfair business practices in the marketplace and to provide information to help consumers spot, stop and avoid them. To file a complaint or to get free information on consumer issues, call toll-free, 1-877-FTC-HELP (1-877-382-4357), or use the online complaint form. The FTC enters Internet, telemarketing, identity theft and other fraud-related complaints into Consumer Sentinel, a secure, online database available to hundreds of civil and criminal law enforcement agencies in the U.S. and abroad. ↑ FTC "FTC Report Sheds New Light on Food Marketing to Children and Adolescents"
↑ International Association for the Study of Obesity "The Sidney Principles"
↑ "Commissioners," Federal Trade Commission website, accessed March 2009. ↑ Press release, "President Obama Announces More Key Appointments," White House Press Office, February 27, 2009. Kevin Freking, "FTC: Kids Target of $1.6B in Food Ads," Associated Press, July 29, 2008. This page was last edited on 2 March 2009, at 18:13.